The publicly owned, 295-acre Original Mason-Dixon Historical Park was established in the 1970s to commemorate the great achievement of Charles Mason and Jeremiah Dixon, the English astronomers who surveyed the Mason and Dixon Line. Brown's Hill is a National Historic Landmark and the Mason and Dixon Line is a National Civil Engineering Landmark. This location has been so honored because it was on Brown's Hill that Mason and Dixon were obliged to end their survey, 23 miles short of their goal. 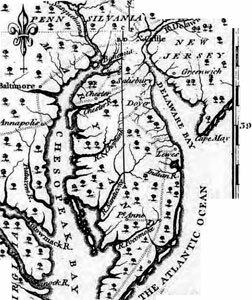 In 1763 the English astronomers Charles Mason and Jeremiah Dixon were hired to settle an 82-year boundary dispute between Penns and Calverts, who had received royal grants in America. They kept a daily detailed journal that was lost for a century; reprints are available at this park. They describe the process of obtaining permission from the Indians to draw the line westward, and the travails of a 4-year, 240-mile mission, cutting a 24-foot-wide swath over mountains and across rivers through the wilderness. Although relations with the native Americans they met and worked with were friendly, there came a point, on October 9, 1767, a warpath, at which safe passage ended. They did continue a short distance, crossing Dunkard Creek three times. For 10 days they made astronomical observations and established their final survey point on top of a steep ridge. Then they returned eastward, unable to complete the last 23 miles of their survey. It was completed 14 years later by other surveyors. Mason and Dixon's journal, created during the survey of the Mason-Dixon Line, was discovered in a pile of trash in a basement in Nova Scotia and then was purchased, transcribed, and printed. For many decades it was out of print before Mason-Dixon Historical Park, Inc., requested permission to reprint it and the copyright was assigned to the Park. Now the Mason and Dixon Journal is available for $35 plus tax ($37.10 total). Check only, please, no credit cards or cash. It can be shipped, but the purchaser must pay postage. The book is soft cover with a spiral binding. It can be purchased at the Park or by calling 304-879-4101.